Before you pick up the phone to call Israel, though, you’d better check the time. If it’s 5 p.m. in L.A., it’s 8 p.m. in New York. But that means it’s three o’clock tomorrow morning in Tel Aviv. It’s enough to make the “time zone challenged” pull their hair out! But relax . . . ha-kol beseder. Jonathan, Eran, and Liat are here to save the day (and our hair!) 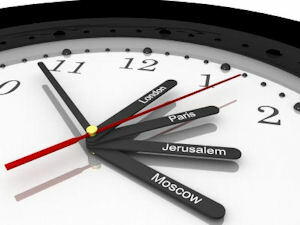 as they help us learn to tell time the Hebrew way. But first, in Lesson 8A, we’ll get to listen in on Liat’s phone call to her dod Moshe and doda Rachel in Los Angeles. This will give us the opportunity to focus once again on the importance of gender in Hebrew. For example, would Liat say, “ze Liat” or “zot Liat”? This review of gender pertinence will come in handy as we start to tell time in Lesson 8B using the feminine set of cardinal numbers. Whoa . . . wait a minute! Feminine numbers?? Yep, Hebrew uses two different sets of words for numbers--one set for masculine and another for feminine. So why do we use the feminine for telling time? By the end of Lesson 8, you’ll know why. You’ll also know how to count up to twelve and use that knowledge to tell time in Hebrew. So whether it’s shmone baboker or shmone ba-erev where you are, Lesson 8 is sure to be achla! Because any time’s the right time for Learn Hebrew Pod!